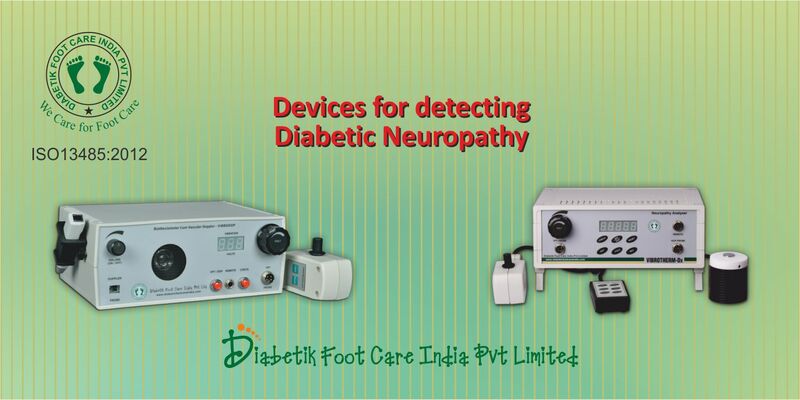 Diabetik Foot Care India Private Limited Manufacturer, distributor and exporter of medical devices for the management of diabetic neuropathy, vascular complications and foot pressure disorders. Neuropathy Analyser - Vibrotherm Dx For Quantitative Sensory Testing Measurement of Peripheral Sensory Thresholds: Vibration and Thermal (Cooling, Heat-Pain). In diabetes mellitus, polyneuropathy is an important complication and should be diagnosed as early as possible in order to prevent damage to the patient. Determination of warm, cold, and heat pain thresholds enables one to judge small nerve fibre sensitivity. Failure to perceive variances in temperature in the extremities is the most decisive early symptom of distal symmetric polyneuropathy, a typical ailment accompanying diabetes mellitus (Ziegler 1988). The VIBROTHERM Dx can determine Vibratory Threshold, Cold pain Threshold and Heat Pain Threshold. This model Vibotherm Dx is a combination of VIBROMETER and THERMOMETRY HCP. Supplied with computer connectivity and software for data storage and patient report generation. Neuropathy Assessment Kit – NA03 This basic Neuropathy Assessment kit consists of one Tiptherm, one VibraTip and Ten 10gm Monofilaments to check the temperature, vibration and touch sensitivity. Early diagnosis of distal symmetric polyneuropathy by testing temperature sensitivity, can prevent complications of diabetic foot. Precious time is gained if examinations are geared towards detecting this symptom. Regular testing of temperature sensitivity should therefore be a compulsory part of basic diabetes treatment. Failure to perceive variances in temperature in the extremities is the most decisive early symptom of distal symmetric polyneuropathy, a typical ailment accompanying diabetes mellitus (Ziegler 1988). TIP THERM® is ideal for testing temperature sensitivity. It is not dependent on external power sources, is practically indestructible, easy to handle and small and light enough to fit in any jacket or overall pocket. VibraTipTM: a wipe-clean, pocket-sized and disposable device for testing vibration sense. The advantages include ease and speed of the test with little required training, less user variability compared with the calibrated tuning-fork test, small size, and easy cleaning. Portable Vibration Sense Device - VibraTip VibraTip a wipe-clean, pocket-sized and disposable device for testing vibration sense. Vibration sense is typically one of the first sensory modalities to be impaired as peripheral neuropathy develops. Graduated tuning forks (e.g. Reidel-Seiffer) and calibrated electronic devices (e.g. Neurothesiometer, Bio-Thesiometer Vibrometer) are recommended to quantify the integrity of vibration sensation. VibraTip is a wipe-clean, disposable, key fob-sized device that provides a constant and reproducible source of vibration. The spherical head facilitates application from any angle and its pocket size means that it is easy to carry and therefore likely to be available at the point of use. Automated Vascular Doppler Recorder for ABI / TBI - VERSALAB Auto DFCI offers a full featured automated ABI / TBI Vascular System for the diagnosis of PAD. ABI / TBI / PVR / Segmental Doppler / Upper extremity / Carotid Doppler / Penile Doppler / Venous Doppler are the different modalities possible with this model. The system includes 6 pressure cuffs, a graphic waveform LCD display, Automatic BP Cuff inflation and deflation along with automatic indices calculation. PC software and USB connectivity is included for storage and performing the standard protocols. Features:- •	Automatic ABI, TBI, PVR and segmental measurement •	Automatic cuff inflation and deflation system •	Guided step by step protocol •	Large graphic LCD display •	Uni-Directional 8 MHz Doppler Probe •	PVR waveform •	Photo plethysmography PPG Toe Sensor for TBI •	Special Toe cuff is supplied •	Separate mode for complete vascular profile study •	Penile flow study •	Gets connected on to any computer •	Standards matching International specification •	Software for patient report generation & storage. Digital Biothesiometer VIBROTEST: Digital Biothesiometer Vibrotest is the essential tool for large-fiber sensory nerve evaluation quantifies Vibratory Perception Thresholds for evaluation of the Peripheral Neuropathy. It is essentially an "electronic tuning fork" whose vibration strength may be gradually increased until the threshold of vibratory sensation is felt by the subject. This device cannot be connected to computer for data transfer. Designed for large diabetic camps and clients who often carry for different locations for remote monitoring.